This complex, which has a total of 11 buildings and opened in 2014, houses 390 male and female students. Located on Martin Luther King, Jr. Avenue, the complex is close to the campus and sits directly across from Mabee Student Center and next to Baugh Visual Arts Center. 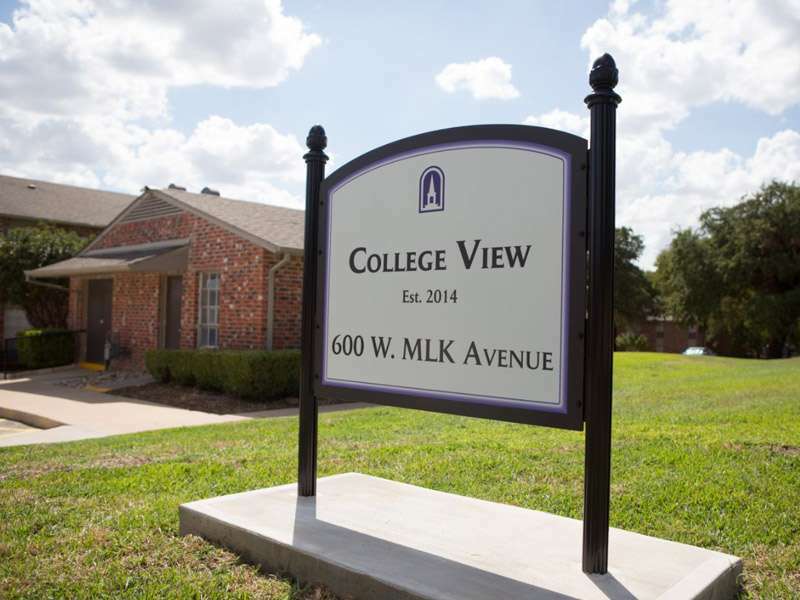 College View offers students three options for living. There are two laundry facilities on the site and a central office area. Resident Assistants are assigned throughout the complex and there is a Resident Director living on-site. Campus Police patrol this area during the day and evening hours. The bedroom is 10’ x 16’ (160 sq. ft.) and has a large closet. The bedroom is furnished with two twin beds, two 80” mattresses, and two chest of drawers. The living room is 11’ x 16’ (176 sq. ft.) and is unfurnished. The dining area is furnished with a dining room table and chairs. The kitchen has a set of cabinets, a pantry area, sink, full-size refrigerator, microwave, dishwasher, garbage disposal, and stove. The larger bedroom is 10’ x 16’ (160 sq. ft.) and is assigned to two residents. This bedroom has a large walk-in closet and a wall closet. The smaller bedroom is 10’ x 11’ and is assigned to one resident. There is one closet in the bedroom. Each bedroom is furnished with twin beds, 80” mattresses, and chest of drawers. The living room is 12’ x 16’ (192 sq. ft.) and is unfurnished.